a pattern company featuring the exclusive designs of Karen Comstock. Karen Comstock is a quilt designer who lives in Cary, NC. After years of perfecting her patterns with students, Karen officially launched her company, Quiltricks, in 2005. She has produced award-winning quilts, five dozen patterns, and traveled from Florida to Oregon exhibiting her work. 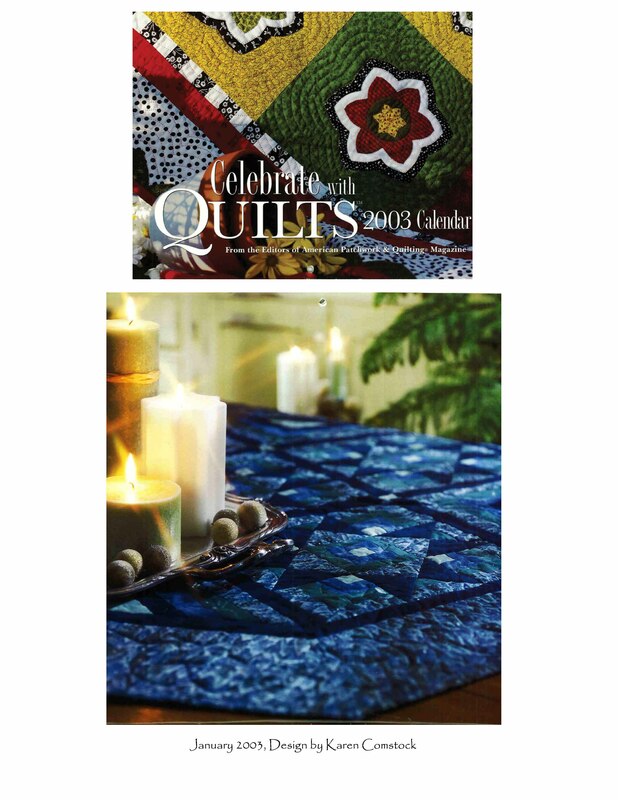 Her designs have appeared in American Patchwork & Quilting Magazine, 100 Blocks From Today's Top Designers and McCalls quilting among others. She is, as her husband likes to say, a calendar girl; her Ohio Cabin quilt was featured as the full-page January illustration of the Better Homes and Garden Quilting Calendar 2003. "Patterns," a national exhibit devoted exclusively to her work, was on display at The National Humanities Center in North Carolina. One of the co-founders of the BeeFF's bee in Cary, she hosts meetings, amateur work days and group retreats in her home. Known as a caring instructor with a warm sense of humor, she is eager to share her love of the craft with quilters of every level.